A leading loyalist who is seriously ill in hospital after a gun attack in County Antrim was shot six times, police have said. 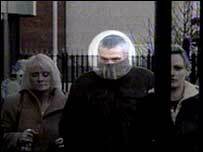 Mark Haddock was shot at Mossley Orange Hall on the Doagh Road in Newtownabbey after he got out of his car. 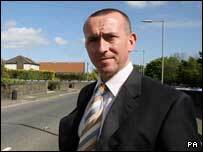 Detective Inspector Gareth Nicholl said paramilitary involvement in the shooting was one line of inquiry. He also said police wanted anyone who saw a black Peugeot 206 or a silver vehicle near the scene to contact them. He said both of these vehicles may have been connected to the attack. It now appears that Mr Haddock may have been lured to Newtownabbey where he was ambushed. However, police have said they are keeping an open mind on the motive behind the attack. "All I will say is that we are keeping an open mind, we have a number of lines of inquiry, we are not as yet 100% sure about any motives," Detective Inspector Nicholl said. On Wednesday evening, officers returned to search the scene where Mr Haddock was shot on Tuesday shortly before 1600 BST. Fellow loyalists are being blamed for the gun attack on the 36-year-old. It has also been revealed that he was in breach of his bail conditions which prevented him from entering the area where he was shot. Mr Haddock is currently on bail on a charge of attempting to murder doorman Trevor Gowdy at a social club in Monkstown. He was named in that court case as a leading member of the Ulster Volunteer Force member. Judgement in the trial has been reserved. It is believed he staggered from the scene of the shooting and made his way to a neighbour's house and an ambulance was called. Meanwhile, UUP leader Sir Reg Empey has defended his assembly alliance with the PUP following the attack. South Belfast Ulster Unionist assembly member Esmond Birnie said if the UVF was behind the murder attempt, his party would have to reconsider its links to the PUP. "This is, as it were, a political marriage and it can be dissolved by either party," Mr Birnie said. However, Sir Reg said he was trying to help stop such attacks. "We have a political arrangement with one MLA and that does, of course, have negative things with it," he said. "But there is also a longer-term commitment I have made. I am prepared to give it a real try." On Wednesday, PUP leader David Ervine said he believed the UVF would have nothing to gain from carrying out the attack. Mr Ervine, whose party is linked to the UVF, said he did not know if that organisation had shot Mr Haddock. "What I can say is that I would feel it is quite ludicrous - given the circumstances of the last few years where this man's name has been bandied about just about everywhere - why didn't they do it then, why now?," he said. SDLP leader Mark Durkan called on the Ulster Unionists to reconsider their relationship with the PUP. Meanwhile, Sinn Fein's Gerry Kelly said the shooting "raises serious questions about who controls these (loyalist) gangs". It is understood Mr Haddock had an address in the area for the last two-and-a-half years but had been living at various addresses in recent months after warnings he could be under threat. He is originally from the Mount Vernon area of north Belfast. 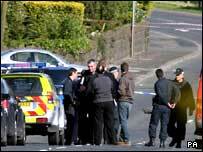 Northern Ireland Security Minister Paul Goggins condemned those behind the gun attack. "This was a vicious attack and I condemn unreservedly those who were responsible for it," Mr Goggins said. "That kind of conduct has no part to play in the future of Northern Ireland." BBC Northern Ireland home affairs correspondent Vincent Kearney said Mark Haddock was accused of several murders and membership of the UVF in the Irish Parliament last year. "The claims were made by Pat Rabbitte, leader of the Irish Labour Party, in October," he said.